Click anywhere in the image below to see the online exhibit for The Art of Devastation, currently hosted by the Google Cultural Institute, which was originally shown at the Frances Lehman Loeb Art Center, Vassar College, January–April 2017. Click on any item in the exhibit to see additional images. Use the image-slider to zoom in on details. Click on the "i" icon to get additional information about each item (material, measurements, additional descriptions, links to data, maps, and more). Online exhibition created by Andrew Reinhard with tools provided courtesy of the Google Cultural Institute. Catalogue content authored and edited by Peter van Alfen, ANS, and Patricia Phagan, Frances Lehman Loeb Art Center. 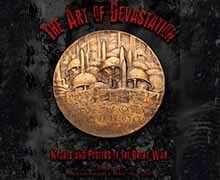 Purchase The Art of Devastation exhibition catalogue, which includes six essays (over 150 pages) from leading scholars on medals and posters of the Great War. Many of the images featured are also part of the ANS online tool The Art of Devastation which is designed to help in the identification, cataloguing, and contextualization of the medallic art surrounding the Great War.